Santorini is one of the most ruggedly beautiful and dramatic places on earth. Santorini , also known as Thira , is the southern most of the Cyclades islands and one of the most popular destinations in all of Greece , for good reason. The most important advice I can give anyone traveling to Santorini is to arrive by boat before sunset and stay on the caldera side of the island for one of the most magnificent and awe-inspiring views on the planet. The magical island of Santorini is truly one of Greece's "must-sees", right along with the Acropolis. Santorini's wild majesty created out of the apocalyptic event associated with mythical Atlantis , is unforgettable. The sunsets, seen while sipping local wine high atop the sheer cliffs is very romantic, and Oia is the place to head for "the" spot to see it. Santorini is a crescent shape surrounding the black volcanic islands lying in the bay. 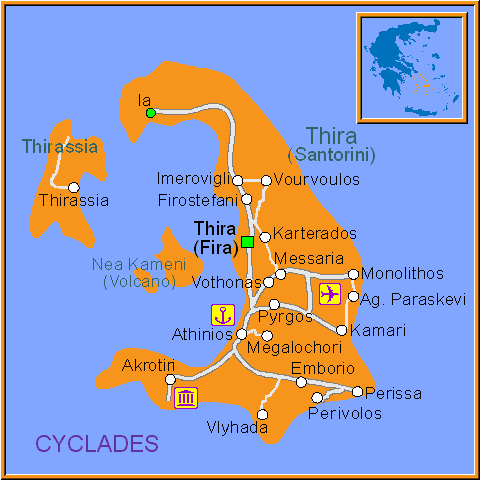 What was once the island of Thira sank to the bottom of the caldera in the apocalyptic explosion in 1450 BC . The lagoon-like caldera measures 32 square miles and is 300 to 400 metres deep. In the center are Palea Kameni and Nea Kameni. On the western side where the volcano is located, the sheer cliffs, 300 metres high, are multi-coloured strata of black, red, grey, and brown. Perched high atop are the scenes most often adorning a poster for Greece, startling white sugar cube houses and churches with brilliant blue domes set against the deeper blues of the sky and the Aegean Sea. The capital of the island is Fira , and it is a lively tourist area and a stop for most cruise ships . If you want to stay just outside of Fira, consider Firostefani or Imerovigli , with the same magnificent views. On the caldera to the south is where we send our friends...to the quieter and romantic Oia. There are interesting and charming towns in the centre of the island that are well worth exploring. The tallest mountain is Profitis Ilias, with a summit only 556 metres above sea level. While you're there, don't miss the live dig at fascinating Akrotiri , and for the culture buff you can also visit the ruins at Ancient Thira. The eastern side of Santorini is a sharp contrast where flat areas meet the beach. The land is flat and fertile. Kamari and Perissa are black sand and pebble beaches with crystal clear waters and a lively entertainment scene. Online Travel guide with the best accommodation in Santorini (Thira). Find the cheapest hotels is Santorini & get exclusive online deals. Great rooms at bargain prices. Book online now! Compare Hotel Prices and read Reviews from others. Great Hotel rates and information See photos, reviews & what's nearby Santorini . Detailed tourist and travel information about hotels of Santorini providing also regional information.